Custom imprinted 14 oz. plastic party mugs are the perfect size for most cold beverages, like beer, lemonade or soda. Plastic party mugs and steins are available 12 colors. The plastic party mugs and steins have a wide open handle with a molded thumb grip. Keep your advertising message or logo in their hands. 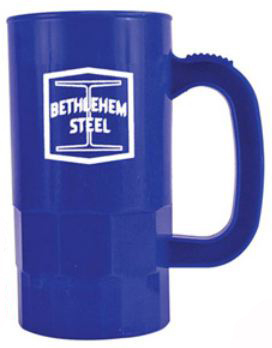 These printed plastic party mugs and steins are ideal for all promotional indoor or outdoor events. Made in the USA. One-color imprint on one or two sides. Above prices include one color of imprint on 1 or 2 sides. Imprint Colors: Black, Dark Blue, Brown, Gold, Dark Green, Kelly Green, Maroon, Orange, Pink, Purple, Red, Silver, Teal, White or Yellow.